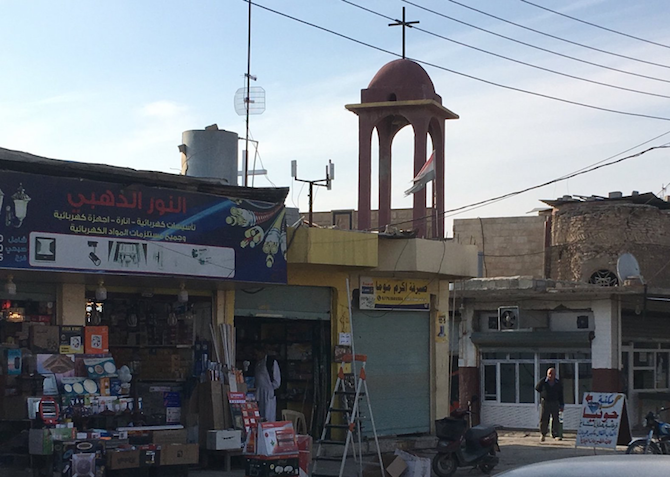 Situated 30 kilometres from the centre of Mosul city, many Iraqi Christians consider Qaraqosh the cultural and symbolic centre of Christianity in Iraq. During August 2014–October 2016, when the town was occupied by the Islamic State in Iraq and the Levant (ISIL), the total evacuation of its population and destruction of its infrastructure led to concerns among many analysts that the Assyrian Catholic town had been erased for good. As was the case across much of the disputed areas in Nineveh governorate, both the Government of Iraqi (GOI) and the Kurdistan Regional Government (KRG) were perceived by the local population as having betrayed the town in the face of ISIL. Nonetheless, in October 2016, Iraqi federal forces and members of the Nineveh Plains Protection Units (NPU) managed to expel ISIL from Qaraqosh. 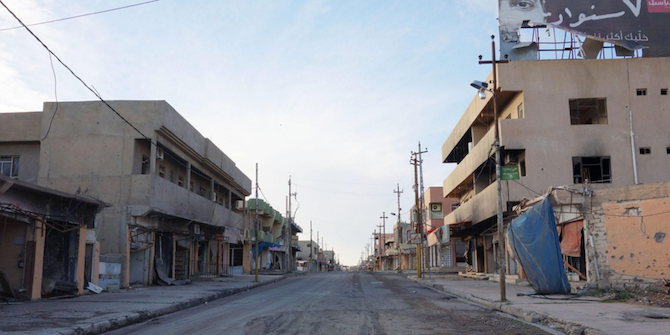 The NPU, a local armed force largely staffed with Qaraqoshi recruits, reclaimed a destroyed town entirely empty of residents – the streets littered with trash and the remnants of demolished buildings. Quickly their hold on the town would receive challenges from other armed groups in control of different parts of the Nineveh Plains. Based on 25 interviews conducted between October 2018 and January 2019, this piece examines the nature of the clashes between the NPU and other forces in the Nineveh Plains, and the peculiar mechanisms of dispute resolution that were employed. At the outset it is important to clarify the uniqueness of the Nineveh Plains Protection Units (NPU) within the context of the Popular Mobilisation Forces (PMF). Technically the NPU falls under the PMF umbrella and its soldiers receive state salaries; however, in practice they operate independently as a locally-oriented force differentiated from the broader politics and strategic aims of the PMF. The NPU second-in-command Mubarak Twaya told us: ‘We have no problem whatsoever with the with the hashd [Arabic shorthand for the PMF]! We work together very well.’ However, later in the interview he noted: ‘The PMF didn’t really fight to liberate Qaraqosh. We did the fighting, and then they claimed to have helped. You know, our fighters are from Qaraqosh, and they’ll do anything for their town. It’s not that way with the PMF.’ The NPU are the only PMF unit with training from the US military, but Twaya openly railed against the United States for having failed to provide equipment and supplies: ‘The US gave us some training but hasn’t given us a single bullet! They failed us.’ In short, the NPU have a tendency to see themselves as allied with everyone and no one, viewing all the powers that be – both the PMF and the Americans – as having short-changed them. This pervasive sense of being under-resourced is not without merit. All other PMF units in the immediate area are larger and enjoy more powerful backers. Incursions of the stronger PMF actors into Qaraqosh began immediately after the liberation from ISIL. Two days following liberation, PMF units comprised of local members of the Shi’a Shabak community arrived in Qaraqosh offering the town protection. The Shabak, a distinct ethno-religious group residing in dozens of villages across the Nineveh Plains, have consolidated power in recent years due to strong linkages with the Shi’a establishment in Baghdad. For the Qaraqoshis, the proliferation of Shabak-dominated units have posed an existential threat, as they were quickly gaining control over all the major roadways leading into Qaraqosh and other Christian towns such as Karamles. Qaraqosh’s community leaders were, in this instance, able to compel the Shabak forces to leave the premises. 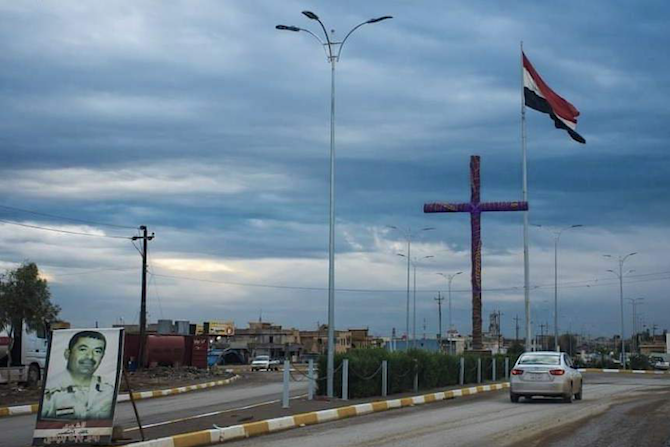 Members of the Shabak community have consistently expressed a desire to encourage positive relations with the Christians of the Nineveh Plains, which may explain why a settlement was reached so rapidly. They would not be so successful with the Babylon Brigade, which arrived six days following liberation. While Brigade leader Rayan Kaldani is Christian, Qaraqoshis from all walks of life view the forces as politically aligned with the Shi’a parties of Baghdad, with little to no concern for the Christian community. Kaldani’s clout and his well-funded, 4000-strong militia made it impossible to turn him down, however. Members of his Brigade took up positions in an empty building close to the centre of town. A fragile co-existence emerged, with the NPU tolerating the Babylon Brigade inside the town and the Shi’a Shabak PMF units just outside of it. But this delicate balance between competing militias would soon unravel, and in each case the process of addressing the conflict would follow a similar narrative. The first clash was between the NPU and the Babylon Brigade. It was the summer of 2017, several months after the town’s liberation. Problems began when the NPU, who were stationed at the entry checkpoints into the town, detained a member of the Brigade for stealing valuable artefacts from Nimrod. As the NPU are not legally allowed to make arrests, they turned the individual over to the federal police. Kaldani’s men did not hesitate at the provocation: they quickly raided and occupied the NPU headquarters. The situation between the two remained at a tense standstill until Bishop Boutrous Mushi placed a call, telephoning Iraqi Prime Minister Haider al-Abadi, who then agreed to send a task force to Qaraqosh. The Babylon Brigades were eventually ordered to leave the town. As the Brigade is both legally and politically aligned with the PMF command, Kaldani had little option but to relent and withdraw from Qaraqosh. The Babylon Brigade departed on 15 July 2017. When we interviewed Kaldani in Baghdad, he expressed open displeasure at what he regarded as the Church’s meddling in the political affairs of the Nineveh Plains. No one in Qaraqosh, however, seemed to feel any remorse at Kaldani’s expulsion. The NPU were also to clash with armed Shabak units, especially as Qaraqosh’s residents began a gradual return to the town in September and October 2017. One incident was mentioned repeatedly during our interviews. In December 2017, a fight broke out at Qaraqosh’s public university, which controversially receives a rising number of students from the Shi’a-dominated southern areas of Iraq. Many Qaraqoshis perceive this non-Christian influx via the university as part of a broader Baghdad-led campaign to force demographic change in the district. ‘The university was constructed for the Christians, but now you see one Christian [for every] ten Shabak,’ said local priest Amar Yako. The incident began when a Shi’a Arab student allegedly insulted a female Christian student. A member of the NPU entered into a brawl on behalf of the woman, and soon elements of the Shabak PMF charged over to the perimeter of Qaraqosh from neighbouring Bartella. The matter escalated to the point that the Bishop of Qaraqosh and the marja’iya in Najaf had to intervene. (The marja’iya refers to the country’s highest Shia clerical authority, Grand Ayatollah Ali al-Sistani.) A team from Najaf was sent to Qaraqosh and the issue was eventually solved, with the marja’iya even sending a delegation to Qaraqosh for Christmas services. In sum, seemingly minor disputes within the local PMF required mediation between the Catholic Church and either the country’s most powerful political leader – the prime minister – or the country’s most powerful religious leader – the Grand Ayatollah. Qaraqosh is not necessarily unique in this regard. The capacity of minority communities to lobby the highest authorities was a recurrent theme throughout our interviews in the Nineveh Plains. (For instance, in the Yazidi town of Bashiqa, local leaders told us that they successfully lobbied the marja’iya, the prime minister and the US Embassy to block the establishment of a PMF headquarters inside the town.) Community leaders in the Nineveh Plains understand the powerful politics of these appeals. One young Assyrian student from Qaraqosh told us: ‘Why do they listen? I’ll tell you. Where did Speaker Halbousi go after he was selected? He went to Qaraqosh to see the Bishop. He wants to say he is with the Christians, for both the Iraqis and the Americans to see.’ Alignment with the Christian community is good political optics. The role of the church in striking deals with the government or the marja’iya merits some explanation. The bishops and priests of Qaraqosh have increasingly taken on political roles amidst the instability of post-ISIL Iraq. Since the liberation of Qaraqosh from ISIL, the Catholic Church has become a key power player in the reconstruction process. Through a reconstruction committee chaired by a priest, the Church dispatched a survey team across the town to assess the level of damage to each and every house throughout late 2016. When NGOs and Christian charities arrived and began operations, they were obliged to draw upon the church’s extensive data, starting construction with the least damaged houses as they required the least investment. By managing data and finances, the church gradually gained the authority to set the terms of reconstruction. Some organisations went so far as to give their funds directly to the Reconstruction Committee. Thus, when the bishop calls the prime minister asking for a favour, he is calling both in his capacity as a spiritual leader and as the arbiter of reconstruction of Iraq’s largest Christian town. 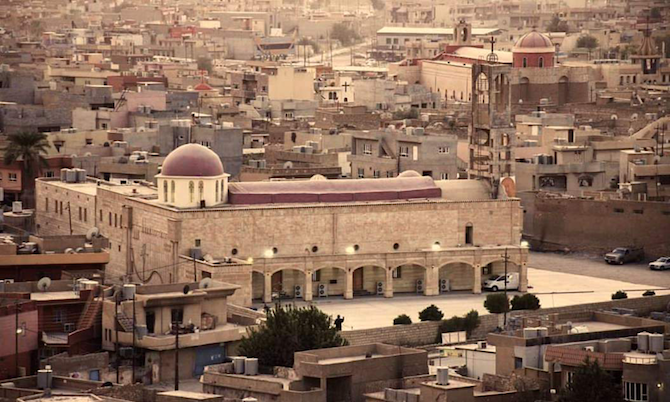 Residents of Qaraqosh are highly ambivalent both about the sustainability of this delicate security situation and the unusual role of the Church in maintaining it. The Christmas celebrations of 2018 highlighted both promising and troubling trends: nearly half of the pre-ISIL population – approximately 25,000 of 50,000 residents – has reestablished some form of local residence over the past year, belying doomsday scenarios that had foretold a post-Christian Iraq. During Christmas services, Priest Ignatius Offy expressed thanks to the NGOs and community members who had worked so tirelessly to rebuild homes, shops and infrastructure. Yet the sentiment on the ground regarding stability’s long-term prospects remains largely negative. The November 2018 explosions in Mosul caused fear of similar incidents to spread across the Nineveh Plains. Moreover, relations with the Shabak remain tense. One interviewee noted abruptly: ‘Everyone is afraid of the Shabak.’ While members from both the Shabak and Christian communities are working towards improving ties, such attitudes remain an obstacle. To date, the Shi’a Shabak militias controlling the major roadways remain pitted against the NPUs securing the perimeter of Qaraqosh. The hardening of this perimeter has guaranteed security but stifled the once thriving local economy, as neighbouring Arab, Shabak and Yazidi shoppers now prefer to avoid the checkpoint shakedown. Youth interviewed were certain they would leave at the first chance due to the lack of jobs and weak infrastructure. The authors thank DFID and the Netherlands Research Organisation for supporting the research. 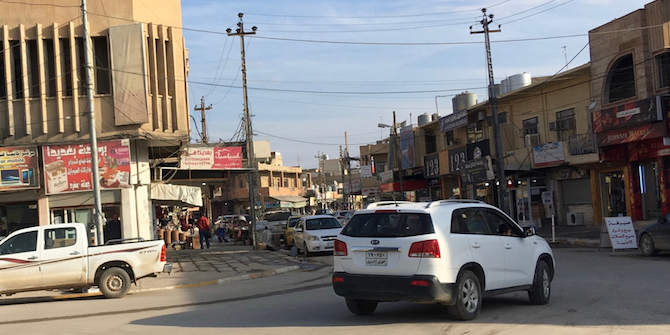 This blogpost is part of the LSE research project Public Authority and Iraq’s Disputed Territories led by Christine van den Toorn, examining the territorial dispute between the Government of Iraq and the Kurdistan Regional Government. This project forms part of the Conflict Research Programme, funded by the UK Department for International Development to provide research and policy advice on how the risk and impact of violent conflict might be more effectively reduced through development and governance interventions. Karam Bahnam is a Peace & Conflict Fellow at IRIS.